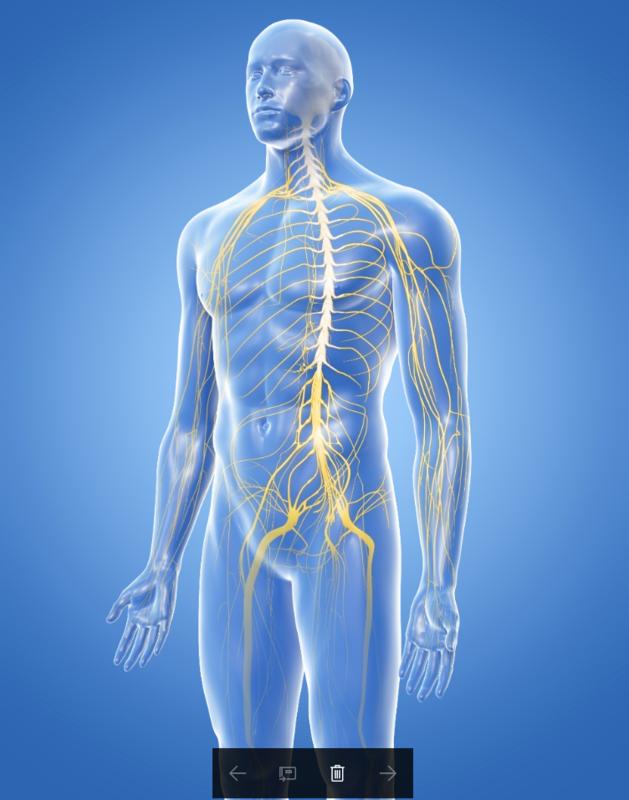 The nervous system is made up of the central nervous system and the peripheral nervous system. The central nervous system includes the brain and the spinal cord. The peripheral nervous system includes all of the neurons that lie outside of the central nervous system. Your brain weighs only 3 or 4 pounds and is approximately the size of your two fists placed together. This small organ controls all of the functions of your body. It senses the outside world and interprets its meaning. It sends the commands that causes your body to act and to react. Your intelligence, your memories, your emotions, your sense of humor, your personality and beliefs; the essence of YOU, is contained within this small organ you could hold in your hands. 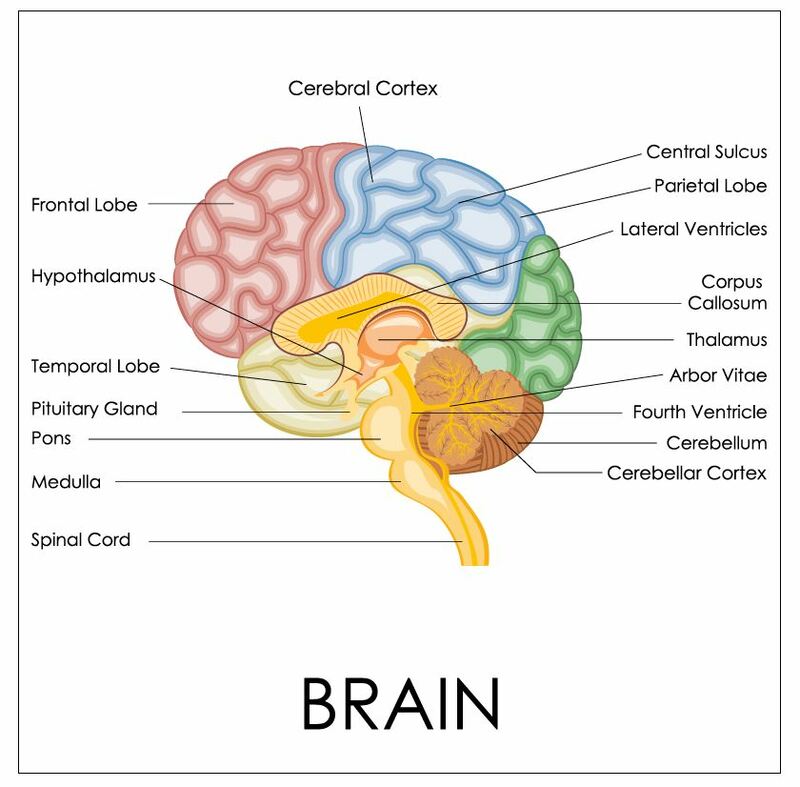 The brain is separated into its major structures; the cerebrum, the cerebellum, and the brain stem. The cerebellum is separated into 2 hemispheres; the left hemisphere and the right hemisphere. Interestingly, all of language processing, including speech and comprehension, lie exclusively in regions of the left hemisphere. The left hemisphere also holds regions used in mathematical concepts, logic, and linear thinking. 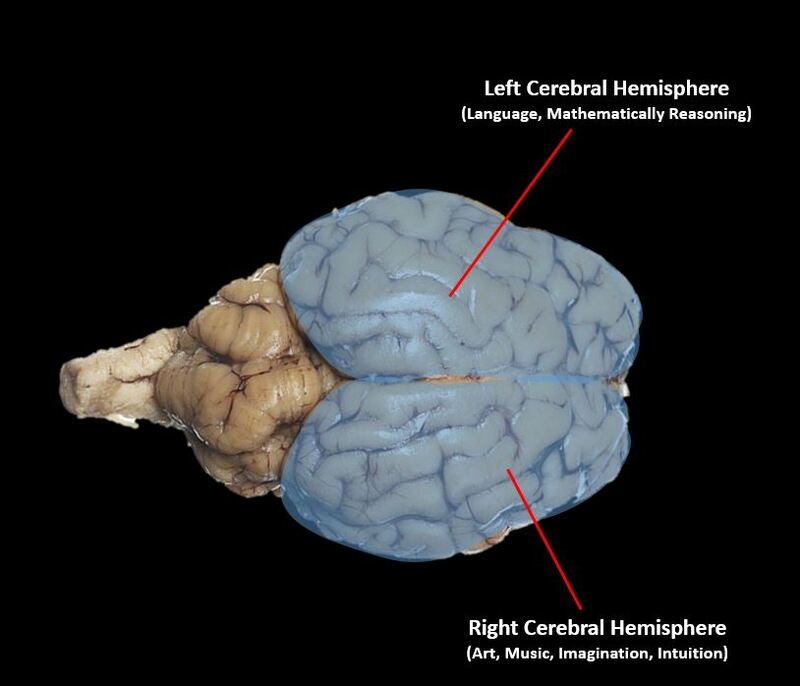 The right hemisphere has regions that are used in creative thinking, arts, and music. 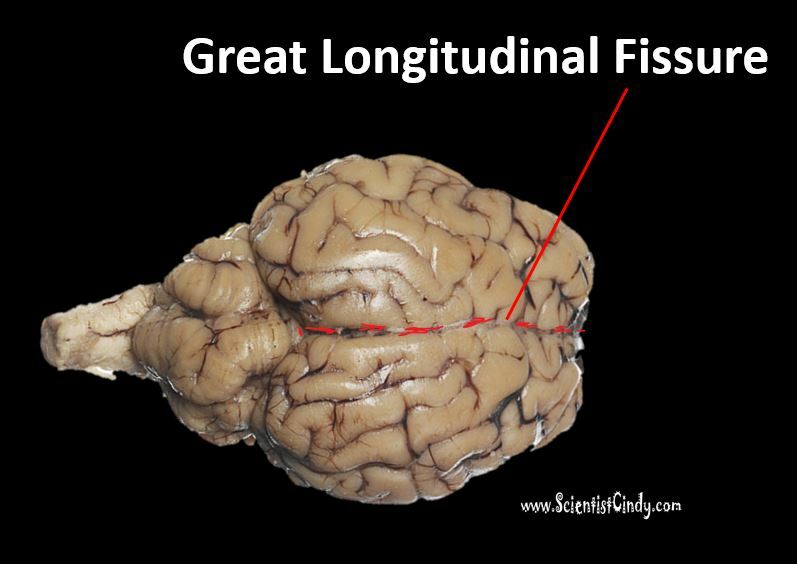 The right and left hemispheres are separated by the Great Longitudinal Fissure. The right and left hemispheres communicate to one another through a structure called the ​corpus callosum. For example, the video below shows a patient that has had the connection between the left and right hemispheres cut. 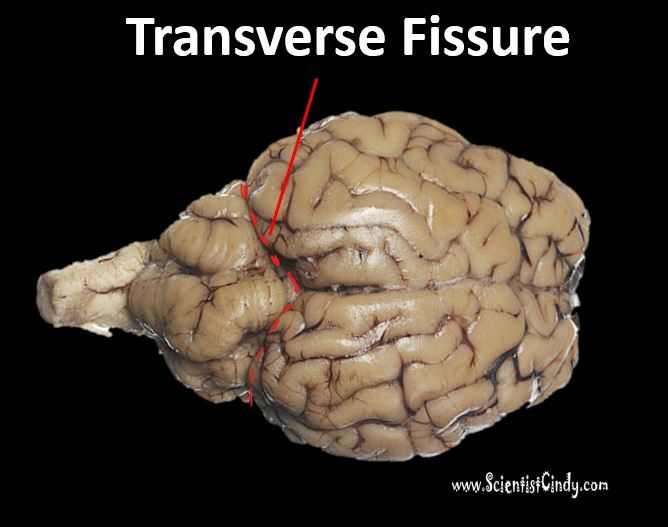 The area of the brain that connects the left and right hemispheres is called the corpus callosum. This structure was cut during a surgical procedure to treat this patient's severe uncontrolled epilepsy. In this patient, the 2 hemispheres are disconnected from each other and work independently from each other. The patient is shown pictures to one eye at a time in a part of the visual field that projects exclusively to either the right or to the left hemisphere. When the patient, 'Joe", is shown a picture of a hammer to his right hemisphere, Joe is unaware that he has been shown anything. However, when the doctor asks the patient to draw "whatever comes to mind" using the left hand (because the right hemisphere controls the left side of the body) he draws a hammer. When the doctor asks what he has drawn, the left hemisphere responds "a hammer". When the doctor asks the patient why he drew a hammer, the patient's left hemisphere responds with "I don't know". The nervous system is divided into the central nervous system and the peripheral nervous system. The central nervous system (CNS) is composed of the brain and spinal cord. The peripheral nervous system (PNS) is composed of spinal nerves that branch from the spinal cord and cranial nerves that branch from the brain. The PNS includes the autonomic nervous system, which controls vital functions such as breathing, digestion, heart rate, and secretion of hormones. The brain includes the cerebrum, the cerebellum and the brain stem. 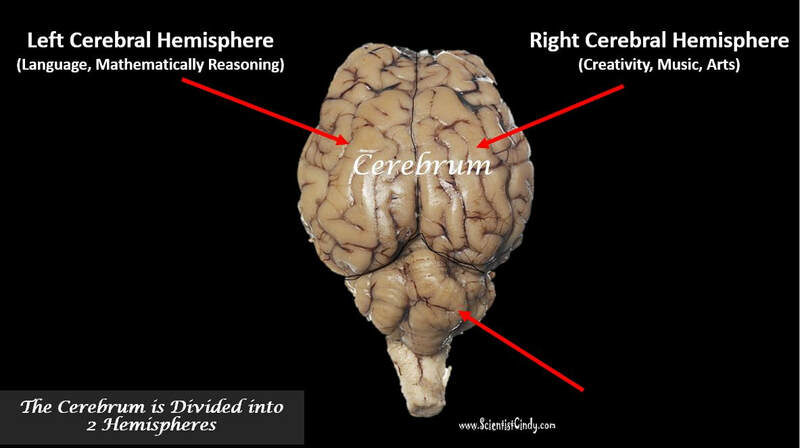 The cerebrum is the largest portion of the brain and it is divided into two hemispheres (the right hemisphere and the left hemisphere) that are separated by a deep groove called the longitudinal fissure. Behind the cerebrum, a mass that exists that resembles a "little brain". 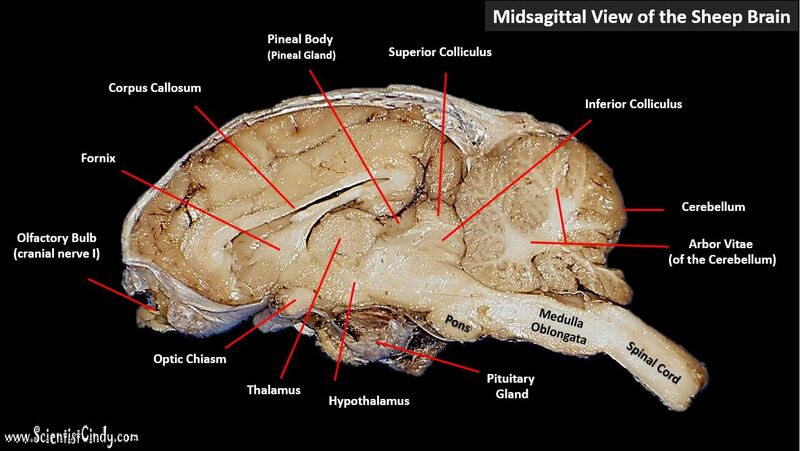 This is the cerebellum. The word cerebellum is Latin for "little brain". This area of the brain is important for motor coordination and hand-eye coordination. 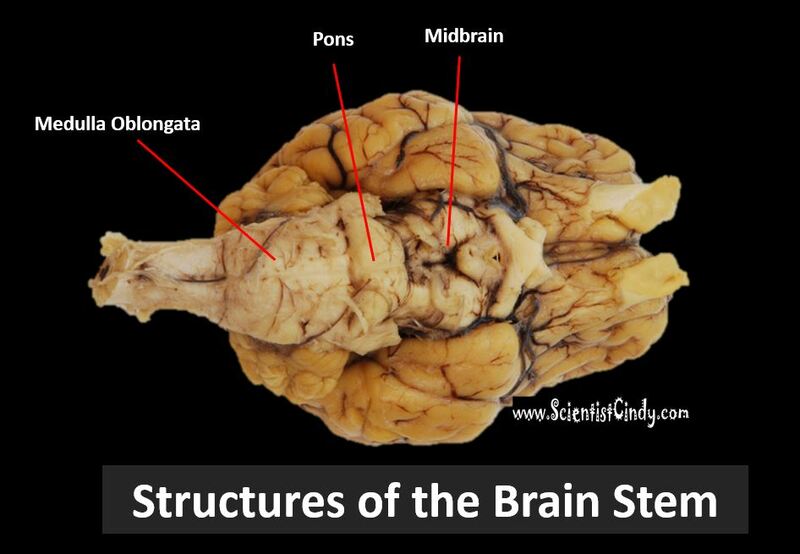 The brain form elongated structure of the medulla oblongata which tapers down to form the brain stem. These areas are collectively referred to as the hind brain and are responsible for lower brain functions of the autonomic nervous system, which includes the regulation of homeostatic body functions (heart rate, blood pressure, temperature regulation). The Motor Cortex - Processes Motor Commands Before They Are Sent to Peripheral Nervous System (part of the parietal lobe). 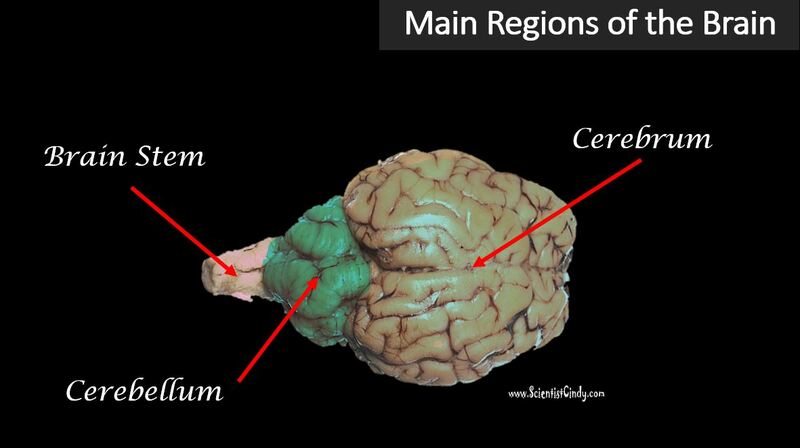 ​ Each hemisphere of the cerebrum is separated into 4 regions called lobes. The frontal lobes lie at the anterior (rostral or ventral) portion of the cerebrum. This area of the brain is more pronounced in humans than other animals. This area of the brain is dedicated to higher-level thinking such as being able to predict outcomes of specific actions. In humans, this area seems to hold much of our personality. 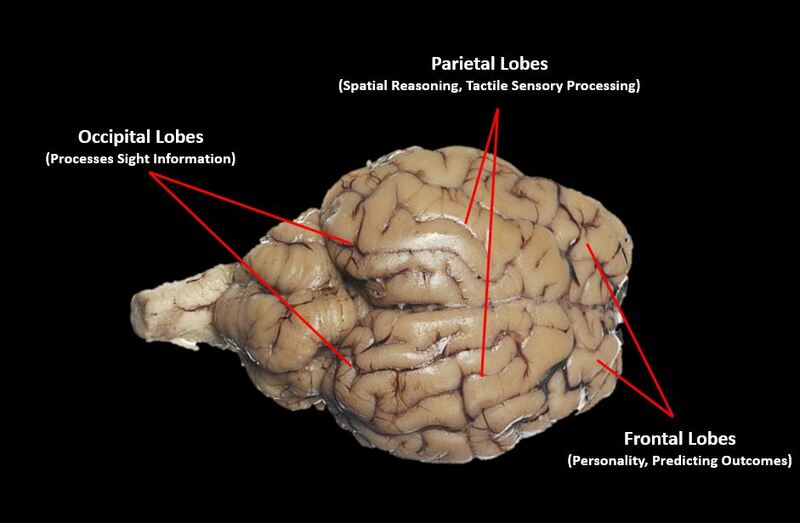 The parietal lobes are important for spatial skills and tactile sense processing. 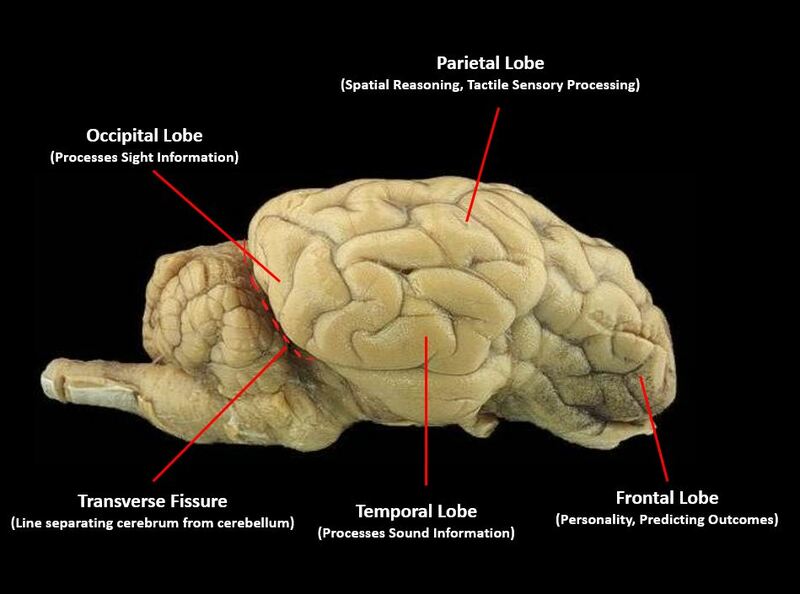 The temporal lobes are located laterally on the cerebrum and are important for processing sound information. 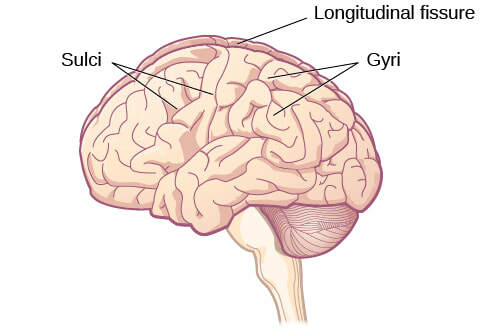 The occipital lobes are located at the back of the cerebrum and process information related to sight. 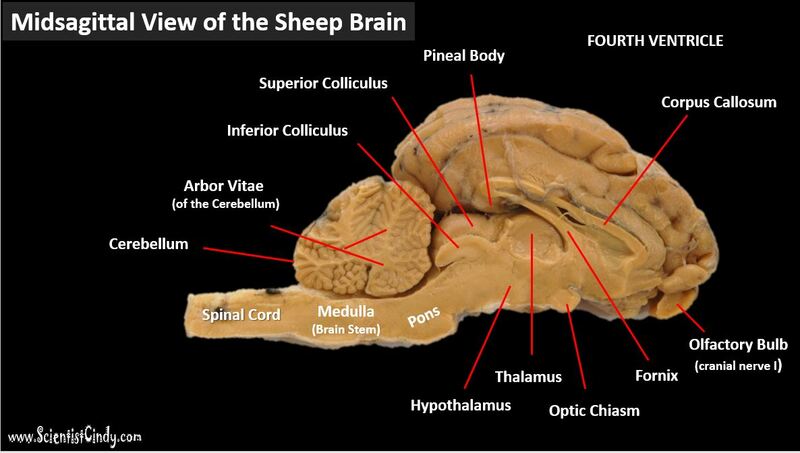 Anatomical structures of sheep brain - sagittal section. 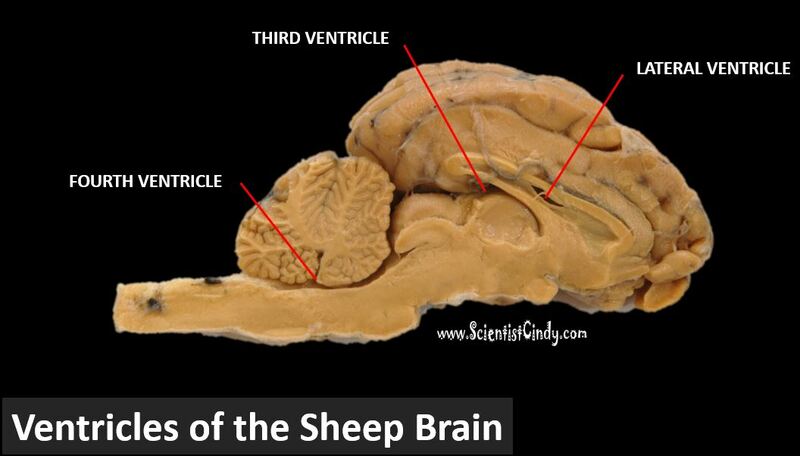 Lateral, third and fourth ventricles - sagittal section of sheep brain. 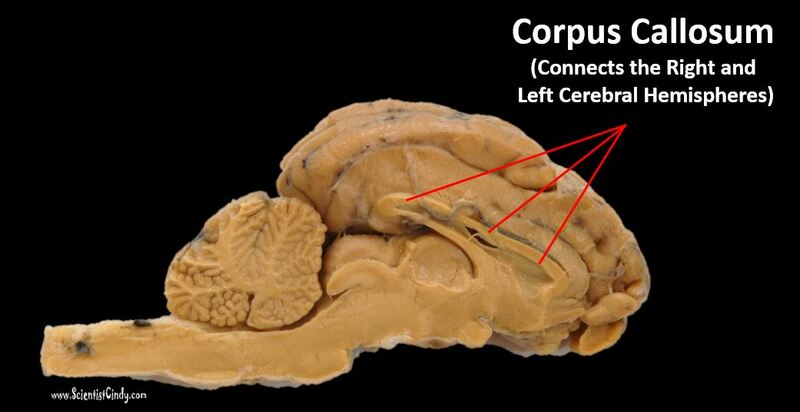 Corpus Callosum - The right and left hemispheres of the cerebrum are connected by the corpus callosum. In severe cases of epilepsy, some patients (referred to as "split-brain" patients, have their corpus callosum cut in order to stop the spread of seizures. White and Gray Matter - Gray matter refers to the outer regions of the brain that appear relatively darker than the interior (deeper) portions of the brain. This area appears darker, because these area contain the cell bodies of the neurons. White matter refers to the inner regions of the brain that appear relatively lighter than the exterior (superficial) portions of the brain. The lighter appearance is due to the presence of myelinated axons of neurons. The Pineal Gland (Pineal Body) - The pineal gland is a small endocrine gland that functions to produce the hormone melatonin, which regulates your sleep-wake cycles. 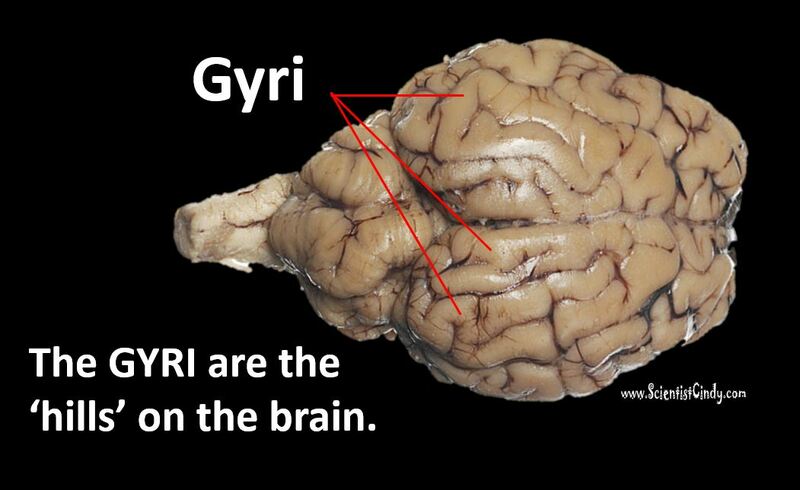 The pineal gland gets its name from its "pine cone-like" appearance. Thalamus - The thalamus gets its name from the Greek word meaning "chamber". The thalamus is the main relay center for motor and sensory information. This area is important for integrating neuronal signals which is important in creating meaningful perceptions. 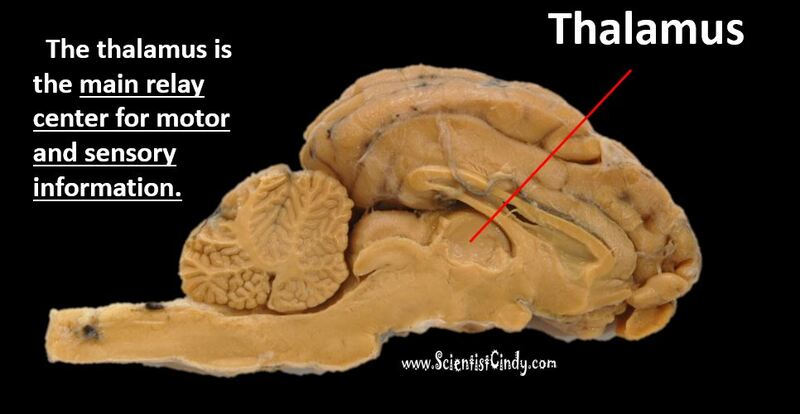 The thalamus is also important for regulating your level of consciousness and level of alertness. Hypothalamus - The hypothalamus is located below the thalamus. 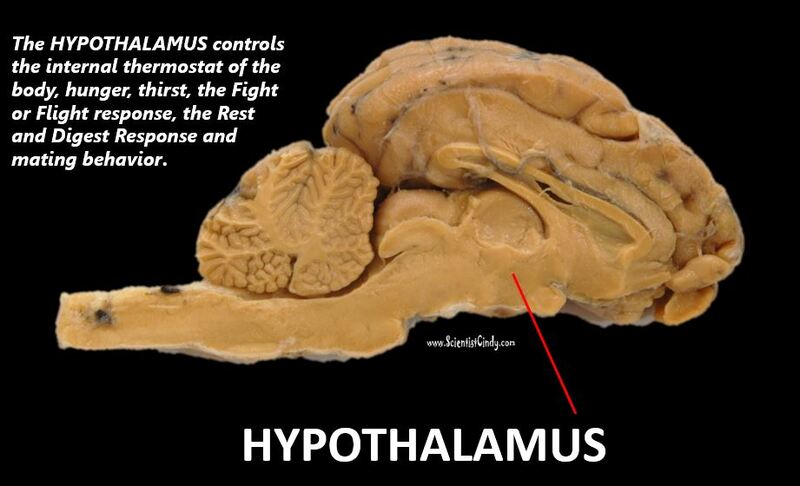 The prefix 'hypo-' means 'below', so its name translates as "below thalamus". The hypothalamus is responsible for regulating metabolic processes including the perception of hunger and the physical uptake of nutrients. Superior Colliculus - Orients eye and head movement toward light stimulus. The superior colliculus allows you to track movements with your eyes. Inferior Colliculus - Orients the eyes and head towards sound stimuli, including the startle response and vestibulo-ocular reflex. Processes auditory information and localization. Mammillary Bodies - Mammillary bodies are located at the base of the brain at the ends of the anterior arches of the fornix. Mammillary bodies are important for spatial memory and recalling events. The Fornix - "Fornix" comes from the Latin word for "arch". 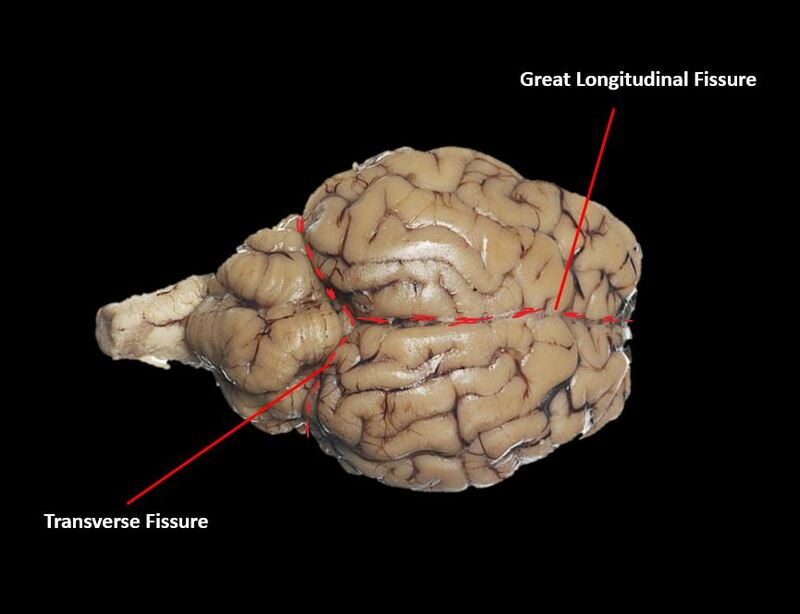 The fornix is an arched (C-shaped) bundle of nerve fibers in the brain that acts as the major output tract of the hippocampus. It may play a role in recall and recognition memory. 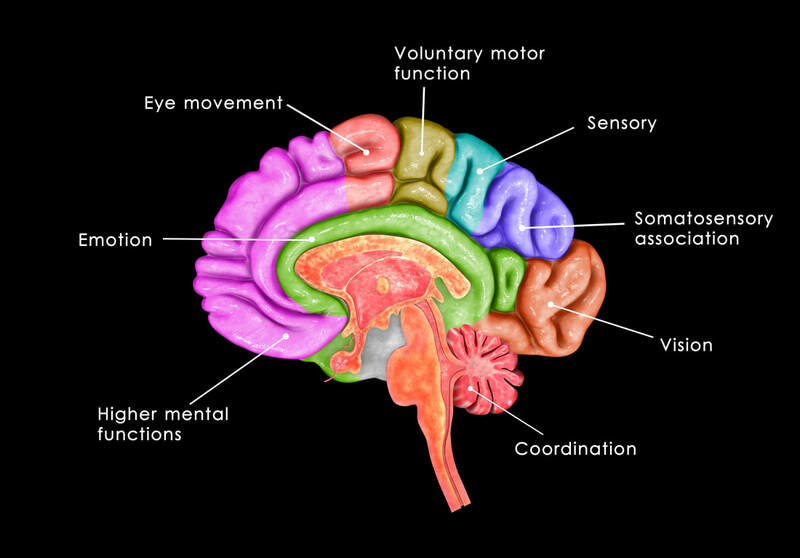 The Midbrain - The midbrain coordinates the perceptions of sight and sound with motor control of the eyes head and neck. The midbrain also regulates alertness, sleep-wake cycles, and body temperature. The Pons - The pons controls sleep, respiration, swallowing, bladder control, hearing, equilibrium, taste, eye movement, facial expressions, facial sensation, and posture. The Medulla Oblongata - The medulla oblongata controls the autonomic (involuntary) functions of vomiting, sneezing, heart rate, respiration, blood pressure. 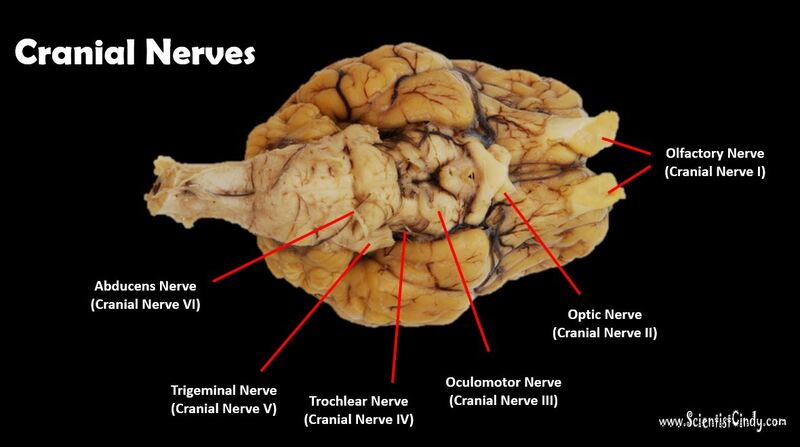 Cranial nerves are the nerves that emerge directly from the brain or brain stem. Cranial nerves relay information between the brain and parts of the body, primarily to and from regions of the head and neck. In contrast, spinal nerves are the nerves that emerge from the spinal cord and project to the body. ​Cranial Nerves III, IV and VI = The oculomotor nerve (III), trochlear nerve (IV) and abducens nerve (VI) coordinate eye movement. Damage to nerves III, IV, or VI may affect the movement of the eyeball (globe). Cranial Nerve V - The trigeminal nerve (V). In charge of sensation to the skin of the face and control the muscles of mastication (chewing). Cranial Nerve VII - Facial Nerve (VII) - In charge of facial expression. A very common and generally temporary facial palsy is known as Bell's palsy is caused by lesion of the facial nerve. Cranial Nerve VIII - Vestibulocochlear nerve (VIII) - Responsible for hearing and balance. Damage can cause nystagmus. Cranial Nerve IX - Glossopharyngeal nerve - responsible for oral sensation, taste, and salivation. Cranial Nerve X - Vagus nerve (X) - Controls heart rate and blood pressure. Cranial Nerve XI - Accessory Nerve - Responsible for shoulder elevation and head-turning. Cranial Nerve XII - Hypoglossal Nerve - Responsible for tongue movement.